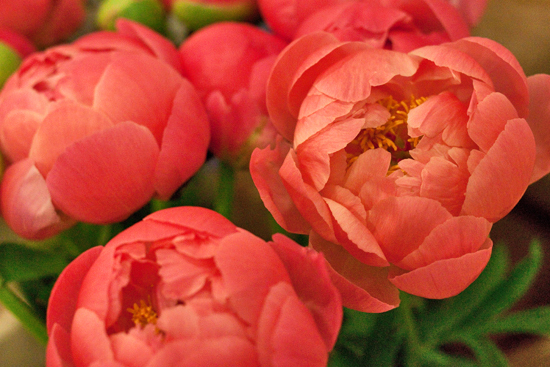 Thank you very much for all your feedback about the first Product Profile last month, which featured the ranunculus. 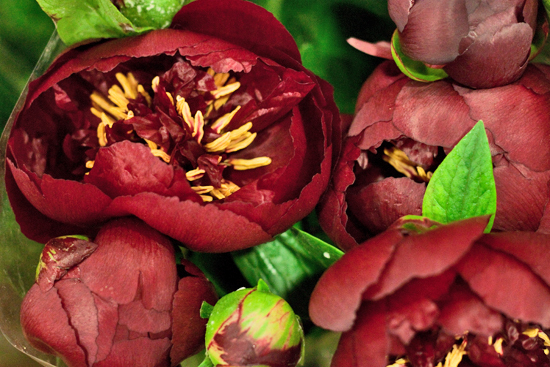 In this month's report, we're going to take a look at a breath-taking flower which is currently at its very prime at the Market…the peony. 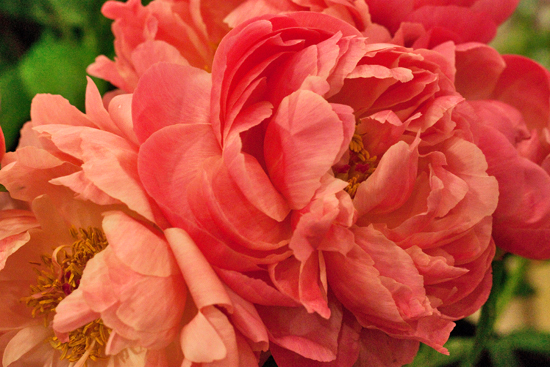 Peonies, whose Latin name is Paeonia, are named after Paeon, who was a physician to the gods in Greek mythology. In bloom, the flowers consist of layer upon layer of petals and they come in single and double varieties. Their peak season, which is when they are at their best, is generally May through to the beginning of July. During this period, they tend to come from Holland and France. 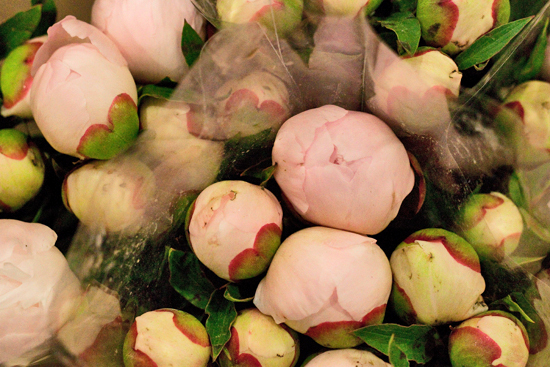 English peonies, weather permitting, are available at the Market from late May/beginning June. The first ones tend to come from Jersey, followed by Cambridgeshire and Lincolnshire. 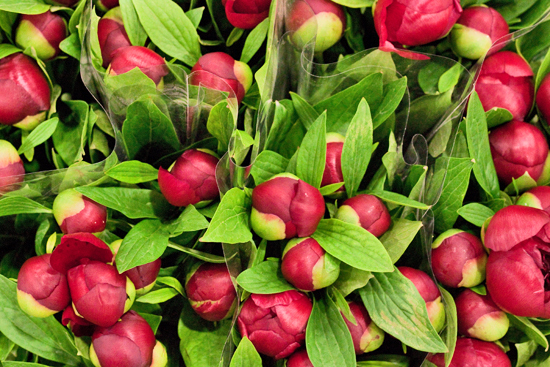 You can usually buy peonies all year round though at the Market. Outside the peak season, they're imported through Holland and may be grown in Israel, Kenya, Chile, Ecuador or South Africa. This blousy flower is extremely popular for weddings, especially in pale pink and white. There are several different varieties of this wonderful flower at the Market at the moment, with more appearing over the coming weeks. We'll take a look at them by colour from pale pink, white and strong pink, to deep pink, coral, red and burgundy. 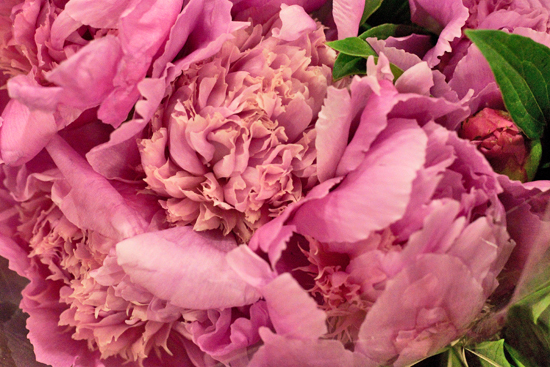 Graeme at Zest, Bobby at Alagar and David at D G Wholesale Flowers all said that the most requested peony is Sarah Bernhardt. 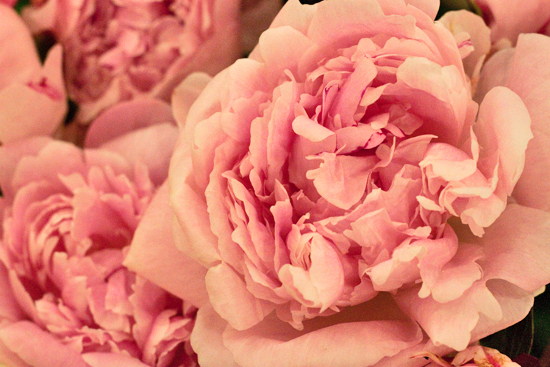 Named after the French actress, these flowers are very sweetly scented and have lots of layers of pale pink frilly petals. 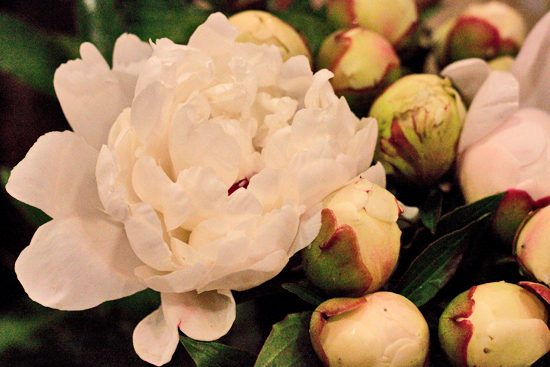 The next most popular peonies are the white variety, especially Duchesse de Nemours. There's also Mother's Choice and Gardenia. Plus there's Festiva Maxima which is white with crimson flecks at the base of its petals. For brides looking to add a splash of colour to their special day, there are Dr. Alexander Fleming and Jules Elie varieties in strong pink. The Flame variety has cupped deep pink petals with golden yellow stamens at the centre of each bloom. 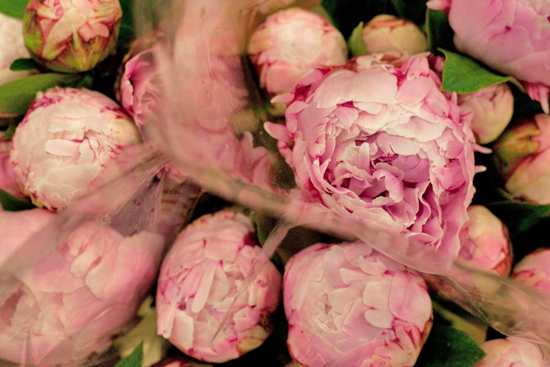 Florist, Simon Nickell from Euphoric Flowers said that peonies are their most requested flower for weddings, as brides-to-be love their full, ruffled and romantic look. 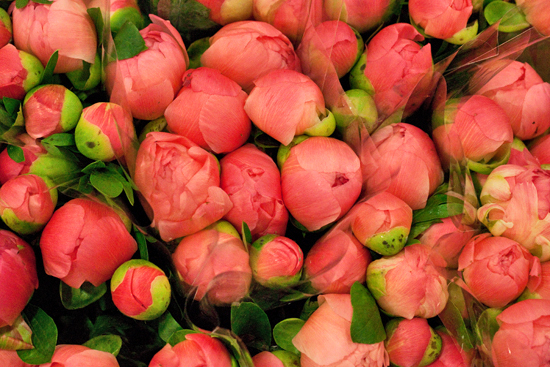 In particular, he noticed last year that brides were starting to specifically request coral peonies for bright, clashing floral designs, taking inspiration from the US. Coral Sunset & Coral Charm are the most well-known varieties. And they have a magical property, in that their petals gradually change colour from coral to yellow. In the red and burgundy colour palette, varieties include Red Charm, Buckeye Belle and Red Sarah Bernhardt. 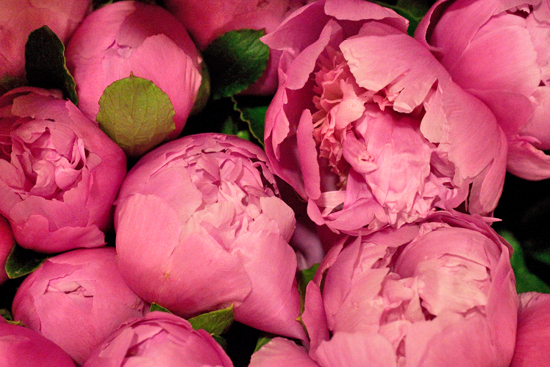 Peonies generally are on sale at the Market in bunches of 5 and 10 stems. Prices range from around £1.50 to £2.00 per stem and may fluctuate depending on supply and demand. 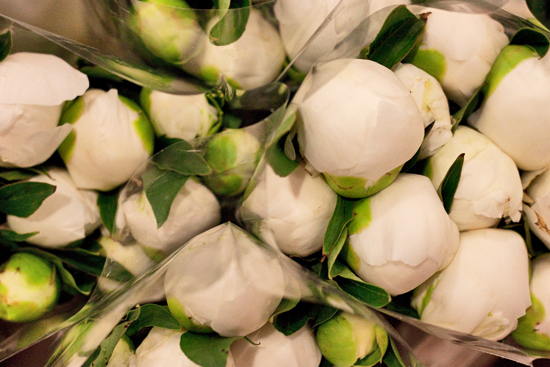 White peonies tend to hold their price well and may be over £2.00 a stem. 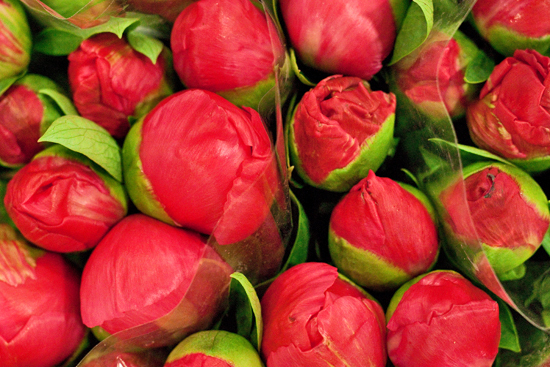 When English peonies are available, they’re usually priced at around 50-80 pence a stem. 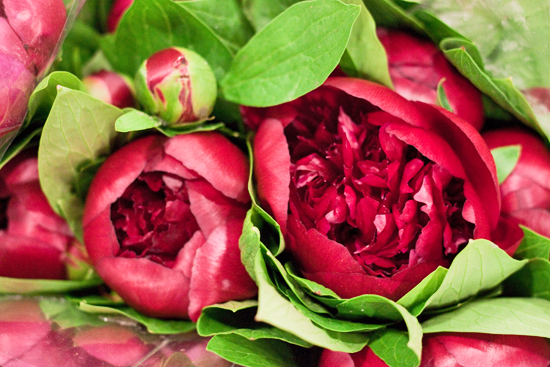 One of the challenges with peonies is to try and get them to look beautiful when you want them to look beautiful. Get the timing right and Ronny at Bloomfield says that they're probably one of the most beautiful flowers that you can buy…but they can be a little bit temperamental! The best thing to do is to visit the Market and talk to the traders. They'll be able to tell you, just by looking at the peonies, as to how many days they think that they'll take to open up. 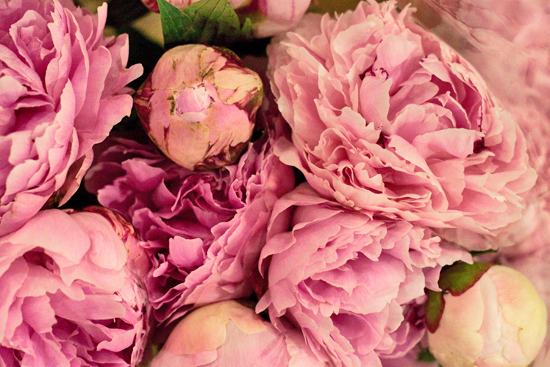 If you have a wedding on a Saturday, you may need to buy the peonies on a Monday. 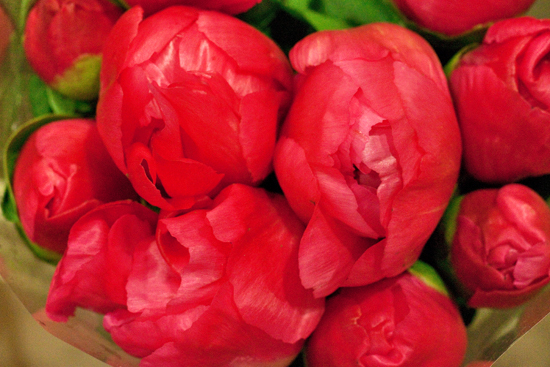 But equally different peonies may be perfectly in bloom for the big day if you buy them on a Wednesday or a Thursday. Also, bear in mind that you may find that in a bunch, the individual flowers will be at different stages of development. And, when bought out of peak season, you can't always rely on them opening. John at S Robert Allen says that when the buds are very tight, you could try to help the flowers open by very gently teasing the outer layers. Bobby at Alagar says that if you're finding that the flowers are taking a little while to open, try placing the stems in warm water and in the sunlight. In complete contrast to some varieties, Coral Charm can open up very quickly. So try and keep them cool and in a dark place if you need to hold them back. I hope you've enjoyed reading this month's Product Profile Report. 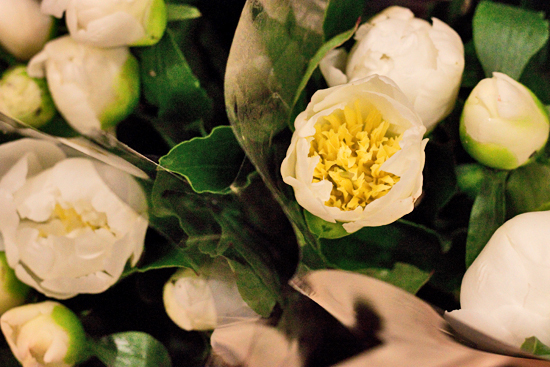 Do visit the Market soon to see these truly captivating flowers, which are in ready supply at the moment.